Samsung Android phone is the best and most widely used smartphone. It is, therefore, its most advanced features and technology allows users to save a large number of files in the storage of the phone. The data may include the music files, video, contacts, messages, photos, apps and the scanned documents both in the internal memory and external SD card in the phone. Despite its ability to store a lot of data, the Samsung phone is at a high risk of losing the data. Having known that the Samsung mobile phone is prone to the loss of data, it is important that the users understand how to recover the lost data from the phone. Here, we set photos as example, to show you how to recover photos from Samsung SD card, because photos are generally located in SD card. 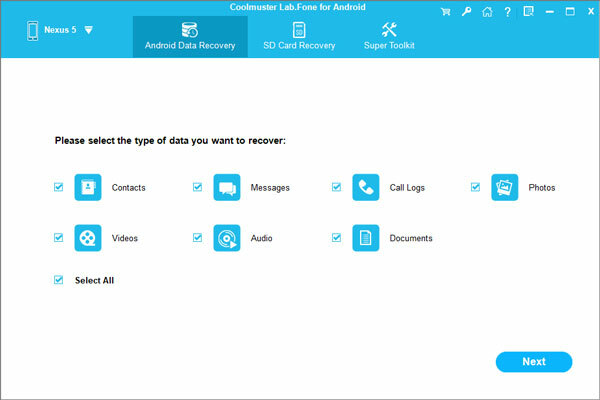 Coolmuster Android Data Recovery provides 1-click ability to help you recover photos from Samsung Galaxy S7/S6/S6 Edge/S5/S4/Note 4/A9/A7/A5 SD card without any hassle. Apart from that, it also recovers contacts, SMS, videos, call logs, music and more from all Android devices. Android Data Recovery is pretty easy to use. It comes with a simplest to use user interface allowing computer novices to handle the program without any question. Now, you can click the download button to have a try for free. 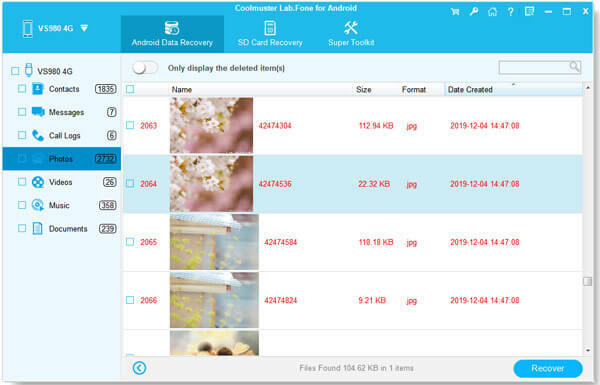 How to Retrieve Lost Photos on Samsung SD Card? To begin with, you should connect your Samsung phone to the computer where you have the Android data recovery program installed. After that, launch it on computer and it will detect the connected Samsung phone automatically. In the second step, you can select the types of files you want to recover. Here, you can open "Photos" category from left, preview all the scanned out photos on the right and then mark those you want to recover. At last, after you make sure all the photos you want to recover have been selected, you can hit the "Recover" button from the bottom right to save all the recovered Samsung SD card photos on your computer.